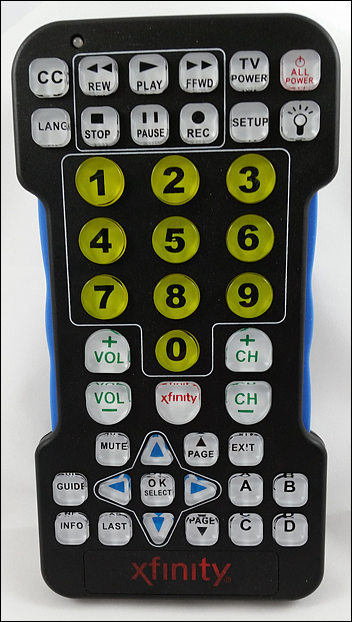 ANSWERED: What is the Xfinity Accessibility Assistance Remote (Large Button), how do I get it, and how can I program it? Comcast offers a large-button remote to Accessibility customers upon request. The large-button remote is a third-party device, offered free of charge, that delivers improved readability of the remote keys and may be easier for our elderly or visually impaired customers to use. The large-button remote is simple to program and can operate two devices at once, such as your TV Box and television. The remote is pre-programmed to work with Comcast's Motorola TV Boxes and TV Adapters. Comcast provides this device for our customers and offers help and support for using it, though we do not manufacture it ourselves. 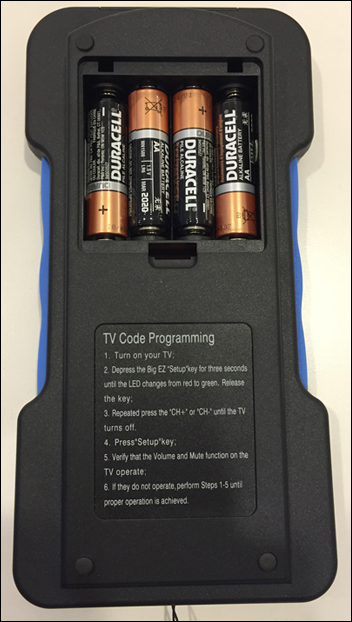 The remote control requires installation of four new AA batteries (included). Customers who are interested in ordering a large-button remote should contact the Accessibility Support Center for Customers with Disabilities. From top left to bottom right, the large-button remote is laid out as follows. Turn on your TV and TV Box and ensure that the included AA batteries have been installed in your large-button remote. If the large-button remote already controls your TV Box, no further steps are required. Press C for control of a Cisco or Scientific-Atlanta brand TV Box. Press the XFINITY button to verify that the remote is controlling the TV Box properly. Why doesn't my remote work to control my TV Box? This remote is designed to work with Xfinity, Motorola and Cisco TV Boxes. If you have certain Motorola or Cisco TV Boxes, you need to program the remote for Motorola or Cisco mode. Follow the steps above to program the remote for control of your TV Box. Install the remote's batteries, and make sure both your TV and TV Box are turned on. 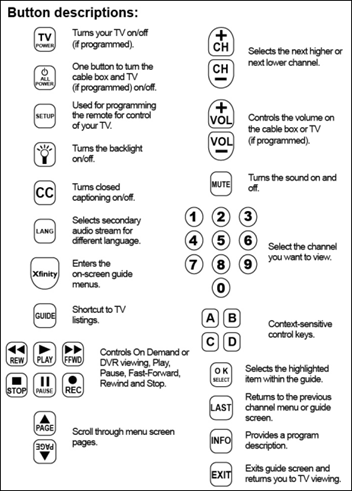 Refer to the TV Device Codes list included with the remote to locate your TV manufacturer. Press and hold the SETUP button on the remote until the status LED light changes from red to green. Enter the first code listed for your TV manufacturer. The status LED should flash green twice when the code is entered. Then press SETUP again. Press the TV POWER button on the remote. If the TV turns off, you have successfully programmed your remote. Turn the TV back on, and verify that the volume and MUTE buttons are controlling the TV sound properly. If the TV does not turn off, or the volume and MUTE buttons do not work, repeat the steps above using the next code listed under your TV manufacturer in the remote's TV Code list. If you cannot program the remote for TV control using the codes provided for your manufacturer, please follow the steps below to search through all available codes. You can also search the Device Codes list. Press and hold the SETUP button for five seconds. The LED indicator will turn from red to green. Press the CH button repeatedly to search through the manufacturer codes until the TV turns off. Once the TV turns off, press the SETUP button. The status LED light on the remote should flash green twice. Press the TV POWER button on the remote. If the device turns on, you have successfully programmed the remote for control of your TV. The TV manufacturer device code list is also included with your remote.